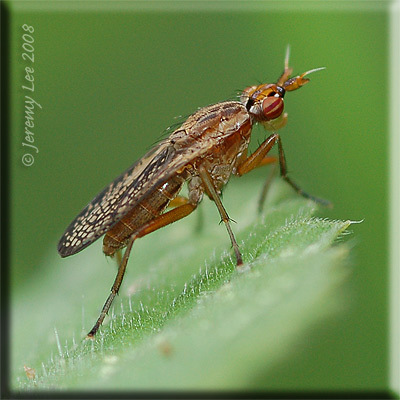 Euthycera fumigata, more commonly known as a Snail-killing Fly, belongs to the Sciomyzidae family of flies which are generally considered to predate snails - the fly larvae parasitising the snails. With the fine 'netted' appearance of its closely overlapped wings it is noticeably slimmer and presents a different appearance to most other flies in the Diptera family. The rather unusual antennae give rise to it being referred to as a 'Horn Fly' in Germany.